Harlingen, a seaport (1947 population, 10,865, with 562 Mennonites; 15,450 in 2007; coordinates: 53.174167, 5.424444 [53° 10′ 27″ N, 5° 25′ 28″ E]) in the Dutch province of Friesland, in which there have been Mennonites from early times. Though the origin of the congregation is unknown, there was a congregation here at the time of Menno Simons, who visited this congregation in 1556, while Leenaert Bouwens baptized a considerable number of persons here (80 in 1551-54; 40 in 1554-56; 88-90 in 1557-61; 648 in 1563-65; 324 in 1568-82, making a total of 1180-82). Leenaert Bouwens lived about 15 years in the neighborhood of Harlingen. By this influx of members the Harlingen congregation, at the same time largely increased by the emigration of Mennonites from Flanders, was the largest in Friesland. In 1566 there were about 450 male members, and about 1680 it is said that more than one fourth of all the citizens of Harlingen were Mennonites. 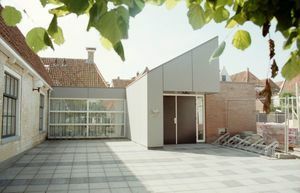 In the meanwhile the Harlingen congregation had been divided into a number of branches, as had occurred in all the Dutch congregations in this period. With Franeker the Harlingen congregation played an important role in the Flemish-Frisian schism of 1566-1567, and numerous meetings, at which the congregations in Flanders and North Holland were also represented, were held in Harlingen. By the close of the 16th century there were found here at least six separate congregations: (1) Waterlanders, mostly called "de Keetsche Gemeynte," after their meetinghouse, which was a keet (former salt barrack), dedicated 17 June 1632, by Idzart van Hettinga, preacher of this congregation, of which Yeme Jacobsz de Ringh was an elder; (2)Frisians; (3) Flemish; (4) High Germans, often called "Blaauwe Schuur Gemeente" (after their meetinghouse "the blue barn," built in 1614 and enlarged in 1641); (5) Huiskopers; (6) Jan Jacobsgezinden. As early as 1603 a number of High Germans (4) united with the Waterlanders (1). In 1610 the Flemish (3) formed a union (Harlinger Vrede) with the Frisians (2). The High Germans (4) (those who had not united with the Waterlanders) merged with the Flemish (3) in February 1643. About this time, or perhaps one or two decades before, a number of conservative members in the Flemish congregation had organized as a separate church, calling themselves (7) Old Flemish and were usually called Ukowallists. Soon after, the Huiskopers (5) merged with the Old Flemish (7). When the High Germans had united with the Flemish in 1643 the meetinghouses of both former groups were in use until the former Flemish church was sold in 1677. This united congregation was a rather large one. Its deacon was Claes Huyberts, who in 1672 presented to the government of Friesland an amount of 500,000 guilders, raised by a collection taken in all the Mennonite congregations of Friesland and loaned to the government for the building of warships. 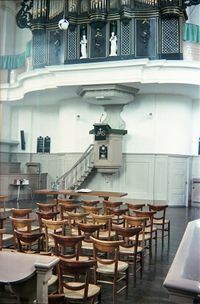 In this year the Waterlanders (1) united with the Flemish-Frisian-High German congregation; both meetinghouses, the "Blaauwe Schuur" and the "Keet," were used until in 1695 the latter was put out of use, causing some dissension in the congregation. This congregation also possessed an orphanage and a house for the poor, which in 1688 were granted freedom from taxation. About 1700 there were still in Harlingen—(a) the United Church (1, 2, 3, 4), (b) Old Flemish (5 and 7), (c) Jan Jacobsz group (6), (d) "Jan Tammes-volk" (followers of Jan Tammes), which was a splinter of the Jan Jacobsz group (6), and of which Jan Jansen Blauw became a preacher in 1708; nothing further is known about it; (e) "Het Kleine Hoopke," a small group of conservative Mennonites separated about 1696 from the United Church (a), of which Douwe Feddriks was the preacher. In the Jan Jacobsz group (6) Lieuwe Willems Graaf and Lambert Klaesz Aker were preachers. Aker served until his death in 1690. It is not known when this congregation died out, but since it is not found in the first Naamlijst of 1731, it was by that time at least no longer in existence. 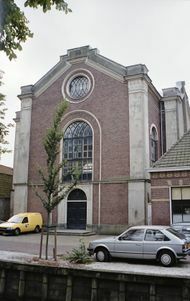 The Old Flemish congregation (h), which in the 18th century was often called the congregation "in de Nieuwe Kerk" (in the new meetinghouse), was until its end served by untrained and unsalaried ministers. It was very conservative and never joined a conference. It died out about 1796. The United congregation (in the 18th century usually called the congregation "van de Oude Kerk," i.e., of the Old Meetinghouse) was among the first to promote the Mennonite Conference of Friesland in 1695. Gillis Vermeersch of Harlingen was its first treasurer from 1696 until his death in 1721. Three following treasurers were also members of Harlingen: Simon Johannes Stinstra 1722-39, Robijn Arjensz 1749-70, and Claas Fontein 1771-87. The congregation seems to have been rather liberal even in this period. A Remonstrant minister was admitted to the pulpit as early as 1705. Incidentally we are informed that under the influence of Collegiantism baptism was several times performed by immersion. The old meetinghouse, "de Blaauwe Schuur," was replaced by a larger one in 1706, which was used until 1857 and then replaced by a new meetinghouse, dedicated 17 September 1858, by P. Cool. During the first decades of the 18th century the congregation contributed liberally for the Fund of Foreign Needs and in 1711, 21 Mennonite Swiss refugees were provided with shelter and even farm land. Among the Mennonite families of Harlingen we find since the I7th-18th century in the records the following names: Boomsma, Braam, Dreyer, Fontein, Hannema, Hingst, Huidekoper, Menalda, Oosterbaan, Stijl, Stinstra. The membership of the United Church, which numbered about 560 in 1695, decreased in the 18th century. In 1838 it numbered 272; in the 19th century it increased again, 1861, 437; 1900, 556. Then in the 20th century, paralleling the decline of Harlingen as an import and export center, the membership declined to 324 in 1930, rising by 1954 to 375. Often it was served by prominent preachers: Reiner Clasen Fontein (1655-1727), a merchant, served from 1694(?) until his death; Joannes Stinstra 1737-85, who was suspended by the government of Friesland 1742-57 on charges of Socinianism; Jan Boelaart 1744-56; Cornelis van Engelen 1748-58; Jan Franken 1756-63; Nicolaas Klopper 1764-86; Heere Oosterbaan, formerly professor of the Amsterdam Mennonite Seminary, from 1786 until his death in 1807; Matthijs van Geuns 1787-92; Freerk Hoekstra 1792-1836; Pieter Cool 1836-72; J. Boetje 1872-84; J. W. van der Linden 1884-1912; E. Engelkes HGzn 1918 until his death in 1929; A. L. Broer 1929-38; J. P. H. Grootes 1939 until his death in 1945, and H. H. Gaaikema from 1946 to the present (1954). There is now a ladies' circle, youth group, Bible circle, and Sunday school for children. 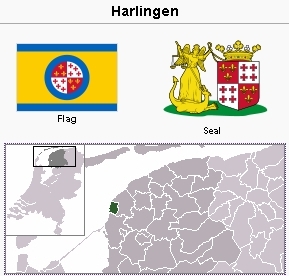 A large part of the membership lives in the villages outside Harlingen. The archives of the congregation contain records (membership, resolutions, etc.) from 1632 and a large number (about 400) of separate documents. In 1996, the congregation decided to demolish their meetinghouse because it had become too expensive to maintain. It was replaced by a new church in 1997, which also includes another smaller organ. Cate, Steven Blaupot ten. Geschiedenis der Doopsgezinden in Friesland. Leeuwarden: W. Eekhoff, 1839, passim; see Index. Cool, P. De stichting der nieuwe Doopsgezinde kerk te Harlingen. Redenen en geschiedkundige mededeelingen daartoe betrehhelijk. Harlingen, 1858. Doopsgezind Jaarboekje (1861): 135; (1877): 115-32; (1878): 78-97; (1880): 1-41; (1893): 1-90 passim; (1909): 147. Hege, Christian and Christian Neff. Mennonitisches Lexikon, 4 vols. Frankfurt & Weierhof: Hege; Karlsruhe: Schneider, 1913-1967: v. II, 256. Hoop Scheffer, Jacob Gijsbert de. Inventaris der Archiefstukken berustende bij de Vereenigde Doopsgezinde Gemeente to Amsterdam, 2 vols. Amsterdam: Uitgegeven en ten geschenke aangeboden door den Kerkeraad dier Gemeente, 1883-1884: v. I, Nos. 522, 523, 539, 557, 558V, 1180, 1216, 1871 f., 1881: v. II, Nos. 1523, 1890-1904. Loosjes, J. “Jan Jacobsz en de Jan-Jacobsgezinden.” Nederland Archief v. Kerhgeschichte XI (1914): 3, pp. 229-31. Zijpp, Nanne van der. "Harlingen (Friesland, Netherlands)." Global Anabaptist Mennonite Encyclopedia Online. 1956. Web. 23 Apr 2019. http://gameo.org/index.php?title=Harlingen_(Friesland,_Netherlands)&oldid=145411. Zijpp, Nanne van der. (1956). Harlingen (Friesland, Netherlands). Global Anabaptist Mennonite Encyclopedia Online. Retrieved 23 April 2019, from http://gameo.org/index.php?title=Harlingen_(Friesland,_Netherlands)&oldid=145411. Adapted by permission of Herald Press, Harrisonburg, Virginia, from Mennonite Encyclopedia, Vol. 2, pp. 662-663. All rights reserved.